I've been meaning to post about my Tsum Tsum collection ever since I started this blog, seeing as it was Tsum Tsums that originally introduced me to Disney blogging! I'm planning on doing a series of Tsum-related posts, including my collection and how I store my Tsums, so when Jade from Outside the Tower tagged me to do the Tsum Tsum tag (originally from On Mitchell's Mind) I thought I'd kick things off with this! 1. How many Tsum Tsums have you got? At the time of writing this I've got three mediums and over 130 minis but this number goes up every month! Damn the Disney Store and their two-collections-a-month releases! 3. Do you have full set? & 4. What is your favourite set? I'm going to answer these together as the answer is the same for both! I'm not a proper collector - I don't try to collect full sets, just the characters I like or Tsums that are particularly cute but I do have one full set - the Chocolate Box Valentine's collection because they are my favourites. I love their polka dot outfits and the ribbons around their tummies! This collection was previously Japan-exclusive and unfortunately I had paid a lot of money to buy up 7 of the Tsums before they announced they were releasing the box set over here! Probably Flash from Zooptropolis at the moment. I made the mistake of not buying the Zooptropolis Tsums when the came out so I'm missing quite a few from the collection that I'd like but Flash is definitely top of the list! Mulan and Hercules. Please. Please. PLEASE. I have some Tsums from both of the Star Wars collections and I'll be buying all of The Force Awakens collection when it's released next month (dat medium Kylo Ren though) but I only have three Marvel ones at the moment - Captain America, Groot and Rocket. I do like Marvel films but I'm not obsessed with them like I am with Disney and Star Wars so I don't tend to pick up many Marvel Tsums. 8. Do you have any ones from Clintons/Target/other non-Disney Store shops? Yes - I've got about 20 from Clintons! I do prefer the Disney Store ones but I love that Posh Paws (the makers of the Clintons & Target Tsums) do a few of their own sizes/variations. I need the medium Judy Hopps from Clintons. I have to say I've been disappointed with most of the male Tsums... They all look so similar! I think the one that annoyed me the most was Flynn from Rapunzel - his goatee is so far down on his face that its not visible when he's sat on a shelf so he could be any other Prince character! 10. Who do you think they should have released with previous sets? Generally I think Disney are pretty good at including a decent range of characters with their sets so the only one I can really think of is that I'd have liked a Jawa Tsum with the original Star Wars collection. But otherwise that's about it! I wasn't sure who to tag in this so if you'd like to take part yourself feel free to use me as your tagger. 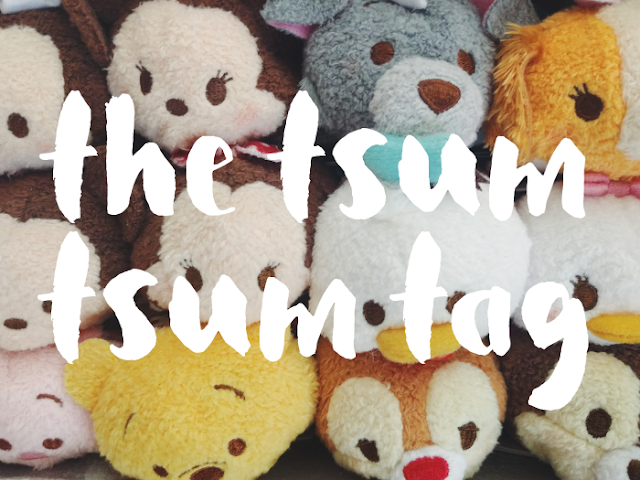 Next up in my Tsum Tsum series will be Part 1 of my Tsum collection (there's too many photos for one post!) so watch out for that soon!